The "Lordship of the Isles" is an evocative, romantic title. It harks back to a period on the far side of recorded history, where established historical fact begins to fade into legend and sagas. Over the five hundred years from 1000 to 1500 the place we now call Scotland only slowly established its northern and western boundaries. At the start of the period much of the north and west of the mainland, and the northern and western isles and the Isle of Man, were all in the hands of the Norse and, to a greater or lesser degree, owed allegiance to the King of Norway. The result was a ragged, diffuse and constantly varying boundary between the areas under the effective influence of Scottish Monarchs based in Dunfermline or, later, Edinburgh, on the one hand, and the areas under effective influence of the Norse on the other. This complex situation became still more complex with the arrival on the scene of Somerled, born of mixed Norse and Gaelic parentage in 1117. In 1140, Somerled married Ragnhild, daughter of Olaf the Red (Olaf I The Red Godredson), the Norse King of Man, whose territory included the Hebrides, and whose titles also included Ri Innse Gall, or "King of the Isles". Olaf was murdered by a nephew in 1143 and succeeded by his son, Ochraidh Godred II the Black Olafson, or Godfrey the Black. Godfrey proved a heavy handed and deeply unpopular ruler and in 1158 Somerled backed a popular uprising against him. Somerled's use of naval power based on the Highland galley, a Viking longboat evolved specifically for use in Hebridean waters, proved decisive and he was able to declare himself King of Man and King of the Isles. Several points are worth making here. The first is that what Somerled had done was introduce a "third force" into the long-standing conflict between the Kings of Scotland and the Kings of Norway over the ownership of the Hebrides. While the title Ri Innse Gall dated back centuries before Olaf the Red, all its holders up to Godfrey the Black owed allegiance to the King of Norway. In contrast, Somerled's Kingdom of the Isles was not a subservient kingdom to the Kingdom of Norway, it was a separate kingdom, independent of both Norway and Scotland. It is also worth noting that the title Ri Innse Gall or "King of the Isles" is often held to be origin of the title "Lord of the Isles". It is a mistake to regard them as the same thing. But it is perhaps fair to regard Somerled as the end of the line of Kings of the Isles, and the originator of the line of the Lords of the Isles, though it would take four more generations to appear in that precise form. Somerled himself came to a sticky end in 1164 when confronting Walter Fitzalan and the army of Malcolm IV on a site near today's Glasgow Airport. Malcolm was as unenthusiastic as the King of Norway about Somerled's "third force", and took direct action to bring his reign to an end. After his death Somerled's Kingdom of the Isles was divided amongst his three sons from his marriage to Ragnhild, and at the same time his unique claim to total independence was lost in the continuing power struggle between Scotland and Norway (and between his sons). The descendants of Aonghus went on to form the Clan McRuari or McRory; the descendants of Dughall went on to form the Clan MacDougall; and the descendants of Ragnald's son Donald Mor McRanald would become the Clan Donald. Let's focus on the last of these. Donald Mor McRanald son, Angus Mor Mac Donald, became the first person to carry the MacDonald name. He was appointed Lord of Islay by the Norwegian King Håkon IV, and fought alongside Håkon against the Scots at the Battle of Largs in 1263. Håkon's loss of the battle and, on his way home, his life, led to the formal ceding of the Hebrides to Scotland by Norway in the 1266 Treaty of Perth. By then Angus Mor Mac Donald had already pledged his allegiance to King Alexander III of Scotland, and in return was allowed to retain his lands. 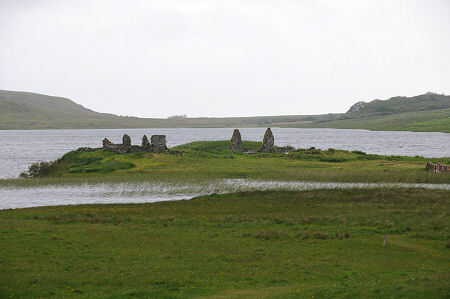 With the Norwegians removed from the scene, the story from here on becomes one of the efforts on the part of successive Kings of Scotland to bring the Hebrides under their effective control: and the efforts of the native Gaelic/Norse population, under the leadership of Clan Donald, to find ways of minimising Scottish control and, indeed, to extend their own control over parts of the mainland. By 1284, "integration" had proceeded far enough to allow Alexander III to invite the three heads of Somerled's strands of succession, including Angus Mor Mac Donald, to take part in a conference, alongside the great and the good of Scotland as a whole, to decide on the succession to the Scottish throne in light of the recent death of his son and only heir. The choice of Alexander's infant grand-daughter, Margaret, the Maid of Norway, seemed to confirm that the Gaelic/Norse chieftains had put aside their traditional ways to establish their positions as part of the wider community of Scotland. Angus Mor Mac Donald's successors were, successively, his sons, Alexander of Islay and Angus Óg of Islay. During Angus Óg's Lordship of Islay he gave considerable support to the cause of Robert the Bruce, including fighting alongside him at Bannockburn. In return he was rewarded with grants of land in Lochaber, Ardnamurchan, Morvern, Duror and Glencoe. Angus Óg was less happy that lands he felt he should have been given in Kintyre were given to Robert the Bruce's grandson, Robert Stewart (later to become Robert II). It seems that despite their having been comrades in arms against the English, neither Angus Óg nor Robert the Bruce entirely trusted one another. And both were probably right not to. The death of Robert the Bruce in 1329 brought about conflict and confusion, as Edward Balliol, with English support, sought to wrest the crown of Scotland from the head of Robert's infant son, David II. By now Angus Óg of Islay had died and been succeeded by his son, John of Islay. Edward Balliol was desperate for support from any source, and offered John of Islay new lands in Kintyre and Knapdale as well as the islands of Skye and Lewis, in return for his support. John accepted, but there is little evidence of his support for Balliol taking any concrete form. What John did instead was write to King Edward III of England, asking for his confirmation of the land grants made by Edward Balliol. In his letter, John signed himself Dominus Insularum or "Lord of the Isles". It was the first time this title had been used, and as a result John of Islay can be regarded as the first true "Lord of the Isles". When David II returned to power, John of Islay was initially regarded as a traitor. In the end practical politics prevailed, and in return for pledging himself to David II, John was allowed to keep all the lands he had accumulated except for Kintyre, Knapdale and the Isle of Skye. John of Islay was a consummate politician and diplomat rather than a warrior, and under the guise of "Lord of the Isles" he was able to recreate most of Somerled's Kingdom of the Isles, which he governed from an administrative centre at Finlaggan on Islay. But while gaining virtually all the powers of a king, John made sure he never gave the impression he was laying claim to be one. And by taking as his second wife the daughter of Robert II he ensured that future Lords of the Isles would also be close relatives of the reigning Stewart dynasty. He was all too aware of the danger that would be posed by the Scottish King should the Lord of the Isles ever be perceived as a threat to Scotland. This was, sadly, a lesson his successors failed to learn. John of Islay was succeeded in both titles by his son Donald. Donald quickly fell into conflict with his Stewart relatives over the vast landholdings of the Earldom of Ross, over which he had a claim through marriage. The ruthless Robert, Duke of Albany, in effective charge of the country, was a poor choice of enemy, and the result was the bloody Battle of Harlaw on 24 July 1411, in which Donald of Islay's advance on Aberdeen was halted. In the aftermath Robert, Duke of Albany, seized a firm grip on the Earldom of Ross and under the Treaty of Lochgilphead Donald was allowed to keep his existing lands in return for giving up his claim on Ross. James I returned from what had, thanks to his uncle, Robert, Duke of Albany, a long imprisonment in England in 1424. The 2nd Lord of the Isles, Donald of Islay had been succeeded by the 3rd Lord of the Isles, his son Alexander of Islay in 1423. By 1426 Alexander was laying claim to the Earldom of Ross (by now a royal possession), and James I responded by imprisoning Alexander, Alexander's mother and many of his followers. James I then tried to pass the title of Lord of the Isles to an uncle of Alexander's and, when that didn't work, released Alexander from imprisonment. Alexander responded by attacking Inverness, so was imprisoned again. This time James I tried to bring the possessions of the Lords of the Isles under direct royal control by sending in an army, which was duly defeated by Clan Donald and their many supporters at the Battle of Inverlochy in September 1431. In the aftermath, James released Alexander from imprisonment again, though keeping his mother as hostage to his future good behaviour. By the time of the death of James I in 1437, Alexander, Lord of the Isles was also using the title of Earl of Ross, this time apparently with the King's blessing. This marked the high point of the fortunes of Clan Donald. With the Hebrides, much of the west coast of Scotland and Ross under his undisputed control, Alexander controlled a considerably larger area than Somerled had done. On the other hand, by moving his base to the richer areas around Dingwall and Inverness, Alexander did much to undermine the unity the Lords of the Isles had once commanded across their heartlands in the west and in the islands. Alexander died in 1449. He was succeeded by his son, usually referred to as John MacDonald II, Lord of the Isles to avoid confusion with the earlier John of Islay. John was the fourth, and final, Lord of the Isles to hold the title in its own right, and many view him as the man whose political miscalculations threw away the enormous gains made by Clan MacDonald since the days of Somerled. John MacDonald II defied the will of James II quite effectively, emerging from the latter's reign in a powerful position. However, during the reign of James III, John MacDonald II made the grave mistake of entering into the Treaty of Westminster-Ardtornish with Henry VI of England. Under this, John agreed to pay homage to Edward in return for English help in gaining control of all of Scotland north of the Forth. The "English help" was never forthcoming, and in the mid 1470s the English revealed the full terms of the Treaty of Westminster-Ardtornish to James III. In response James III stripped John MacDonald II of large parts of his land and a number of his titles, and though he retained the title of Lord of the Isles it was no longer to be inherited, in future its holder being determined by the Scottish Crown. In the face of this huge loss of prestige, John was overthrown as chief of Clan Macdonald in a coup mounted by his illegitimate son Angus Óg. John tried to reassert his power after the murder of Angus Óg in 1490. But his efforts to regain the Earldom of Ross, were fought off by the Mackenzies. And in 1493, James IV finally gave up on John as a force capable of controlling western Scotland and stripped him of the title of Lord of the Isles. John lived out his days in lowland Scotland on a royal pension. And the Lordship of the Isles? Legally it lived on beyond its removal from John by James IV and joined a growing collection of titles the monarchy acquired over the centuries and retained under the monarch's personal control. Today the holder of the title of Lord of the Isles is also the Duke of Rothesay, the Duke of Cornwall and the Prince of Wales: HRH Prince Charles.